Crystal asks: Is there any truth to the story of the “Green Children of Woolpit”? English folklore is filled with green people – the Green Knight, green fairies, the Green Man and Jack-in-the-Green. 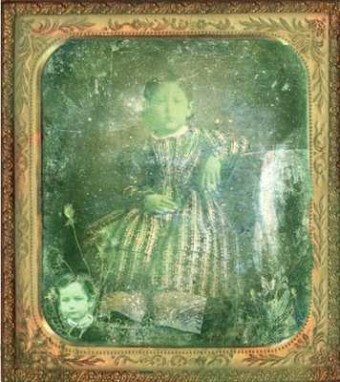 Two of the smallest were the Green Children of Woolpit. Depending on whom you read, the Green Children first appeared during the reign of Stephen (1135-1154) or that of Henry II (1154-1189). One year during the harvest in the village of Woolpit in Suffolk, England (about 10 miles from Bury St. Edmunds), reapers working near old wolf pits (deep ditches dug to trap wolves) discovered two apparently lost young children – a girl and boy. It was as if they had been skillfully fashioned from summer leaves or soft meadow grass, for just like their clothes, and even the strange hue of their eyes, their skin was green! When the shoots were handed to them . . . [the children] amazed their observers by ignoring the bulging pods . . . and splitting open the stalks instead . . . they did not discover any beans . . . until they were shown that the beans were contained in the pods. At once they began eating the beans, and from their evident delight it was clear that these were a familiar food to them. There is no dispute that she learned English, was baptized, eventually “married a man from King’s Lynn,” in Norfolk, and at some point took the name of Agnes Barre. In at least one account she was rumored to have become “rather loose and wanton in her conduct,” while in another, she was alleged to have married a diplomat, Richard Barre. She asserted that the inhabitants, and all they had in [their home] country, were of a green colour, and that they saw no sun, but enjoyed a degree of light like what is after sunset . . . . that [she and her brother] were following their flocks [when] they came to a certain cavern, on entering which they heard a delightful sound of bells . . . they went . . . wandering on through the cavern, until they came to its mouth when . . . they were struck senseless by the excessive light of the sun and . . . thus they lay for a long time. Being terrified . . . they wihsed to fly, but they could not find the entrance of the cavern before they were caught. Are folk of St. Martin’s Land . . . and remember only that one day we were feeding our father’s flock in the field when we heard a great noise like bells . . . And on a sudden we were both caught up in the spirit and found ourselves in your harvest field. . . Among us no sun rises . . . . Yet there is a land of light to be seen not far from us, but cut off by a stream of great width. Two contemporary scholars recorded the story: a Benedictine abbot, Ralph of Coggeshall, contributor to Chronicon Anglicanum, and William of Newburgh, author of Historia rerum Anglicarum. Where Did They Come From and Why Were They Green? Assuming the story was true, many have theorized as to the origin of the children and their green color, including that they were space aliens (of course) or that they came from another dimension. Some have posited that arsenic poisoning could account for the children’s green coloring (as well as their lack of appetite and the boy’s poor health). Arsenic has been used in the production of green dyes, and it apparently will discolor the skin in a green-dotted rash. However, if the children presented with a rash, it seems unlikely the villagers would so eagerly take them in rather than fear deadly diseases like leprosy, measels and smallpox. A more likely cause of the tinge could be chlorosis, a form of anemia characterized by a greenish tint to the skin. Well-known in earlier years, it was common at the turn of the 20th century “among ill-fed, overworked girls” until iron supplements were used to treat it. In any event, it is easy to imagine how two young medieval children, who did not even know how to get beans from a pod, would be nutritionally (and iron) deficient. Writer and editor Paul Harris has proposed a plausible scenario. He opines that the children were Flemish immigrants whose parents were killed during persecutions in the area during the latter half of the 12th century (including in the battle at Fornham in 1173). In addition, the River Lark runs near Fornham St. Martin, and the area around Bury St. Edmunds is riven with underground passages from flint mines that had been in the area for thousands of years. Detractors note that the Flemish persecuted during Henry II’s reign were mercenaries, paid to fight the King and who “would hardly have brought their families with them.” In addition, these Flemish had been in the country for a while, and it is unlikely that no one in Sir Richard’s household would have recognized the children’s language. Furthermore, although there may be passages nearer Woolpit, the major flint mines, Grime’s Graves, are located 20 miles north of Bury St. Edmunds. A centuries-old East Anglian legend [that] tells of how two young children, heirs to the estate of their dead parents, were poisoned with arsenic and then abandoned by their evil guardian in the depths of Wayland Wood. Wayland Wood, however, is 25 miles from Bury St. Edmunds. This world and it’s many mysteries will continue to fascinate. While this story is strange it seems to confirm the “Hollow Earth” legend. Green humans, normal but speaking a strange language. I never heard of this until recently. I know College grads who’ve never heard of Tesla. There was once a $500 bill but ask a kid today and they will never have heard of one. Knowledge is power, and the information today is diamond. Someone once said if you want too keep knowledge from black people put it in a book. It seems that black folk aren’t the only ones being left in the dark. By the way, what ever happened to the children of Hamlin once the Pied Piper led them into that mountainside? The story says the children apssed through a cave from a land where the sun never rose. It never said they lived in caves. I don’t get where people get that from. And there’s many stories of doorways to other places across multiple disconnected cultures. The Egyptian “stargates” are the most famous examples, but native South Americans had them, as well as one tribe in America that believed it knew the entrances to an alternate realm inside of a lake and along a hidden cliff wall. Alternate realm inside a lake along a cliff wall ? Where can I find more information about that ? Sounds interesting..